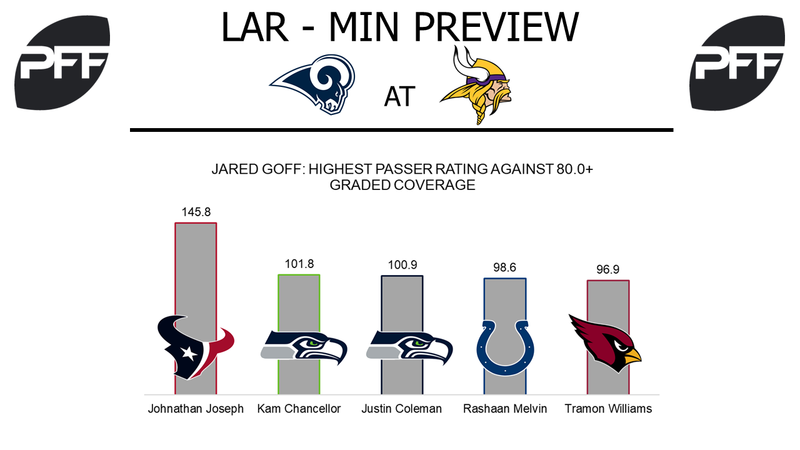 QB Jared Goff vs. Vikings secondary – Jared Goff will face a Vikings secondary that has three starters with coverage grades above 80.0, with their slot cornerback Terence Newman owning a 79.8 coverage grade. Through the first nine games of the season Goff has attempted 86 passes against defensive backs with coverage grades at or above 80.0. He has completed 48 of those for 649 yards, one touchdown, while have his receivers drop six passes. He faired much better against the cornerbacks in those situations, completing 37-of-62 passes for 485 yards, one touchdown, and four drops. He will need to be on point going up against cornerback Xavier Rhodes, who has not allowed a single touchdown all year and has the eighth-lowest passer rating allowed among cornerbacks at 59.0. RB Todd Gurley vs. Vikings run defense – The first half of the Rams’ Week 10 matchup against the Texans is a perfect example why getting the run game going is important for the Rams. While Gurley has been solid at making people miss all year, he has picked up that aspect of his game since Week 7. In that time, he owns the fourth-highest elusive rating at 53.5 and the third-highest average in yards after contact per attempt at 3.27. The Vikings were the second-most efficient team in terms of tackling through the first six weeks, but have fallen to the fifth-worst since by missing 15.1 percent of their tackling attempts. Rams offensive line vs. Vikings pass-rush – The Rams’ offensive line has been lights out since Week 6 of the 2017 season. They have allowed the second-fewest amount of quarterback pressures out of any team in that time span with 25, while owning the fifth-best pass blocking efficiency as a unit with an 84.8. Meanwhile, their Week 11 opponents are generating a pressure percentage on 34 percent of plays, which is right at the league average. The key to the Vikings’ pass-rush are quick pressures, which is when they get a pressure at or below 2.5 seconds from the snap of the ball. Of 120 pressures the Vikings have generated since Week 6, 80 of them have come at or below 2.5 seconds. Eliminating those types of pressures will be huge as quarterback Jared Goff owns fourth-highest passer rating when taking 2.6 seconds or more in the pocket with a mark of 102.5. 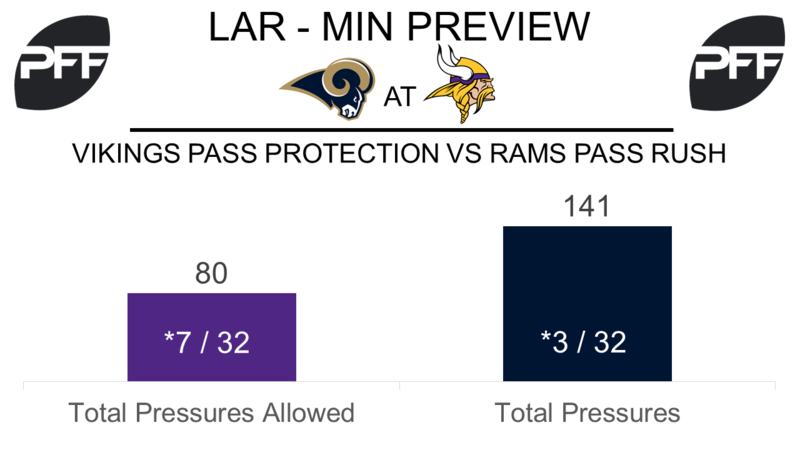 Vikings pass protection vs. Rams pass-rush – Though the Vikings rank 22nd in the league in terms of total passing plays (322), the Rams’ defense could cause some problems on the few passes Minnesota throws on Sunday. The Rams have earned a pressure 44 percent of the time opposing offenses have dialed up the pass, which ranks No. 3 among all NFL defenses. The Vikings’ offensive line ranks eighth in pass blocking efficiency (PBE) and has only surrendered four sacks this season, the fewest total among all NFL offensive lines. WR Stefon Diggs vs CB Trumaine Johnson – Diggs is still performing at a high level since returning from injury in Week 8. He is PFF’s ninth highest graded receiver with an overall grade of 83.8. All members of the Vikings’ quarterback carousel have had success throwing to Diggs in 2017, as his wide receiver rating ranks fifth in the NFL (136.8). When targeting Diggs, Vikings quarterbacks have thrown five touchdowns against zero interceptions. Johnson has given up the seventh-most yards in coverage this season at 497, with 329 of those yards coming before the catch. Johnson has also allowed 1.59 yards per coverage snap, which ranks 15th-highest in the NFL. QB Case Keenum vs LB Mark Barron – When passing short (0-9 yards), Keenum has earned a 16th-ranked passer rating of 92.3, throwing for four touchdowns and two interceptions. Keenum has been at his best on play action passes, as he has earned the third-highest completion percentage (72.6) and fifth-highest passer rating (126.1) on such dropbacks this season. Keenum, however, will want to avoid throwing Mark Barron, as the converted safety has the sixth-best coverage grade by a linebacker this season (85.8). Quarterbacks are only achieving a passer rating of 69.2 when targeting Barron, the fourth lowest among linebackers.